I’m sure you’ve read or heard about mindfulness. If you’ve wondered what all the buzz is about and are curious about how practicing mindfulness and mindful parenting can produce real-life benefits for you and your family, this article is for you. I hope this personal story will help you better understand. And, if my story inspires you, I can help you and your family jumpstart your mindfulness practice with a free download. To be completely honest, I felt unsure about sharing something so personal. My head (fear-based thinking) told me I shouldn’t allow people outside my family to get such a raw glimpse inside my family’s life. What if people judge me? Or worse, what if they judge my son? 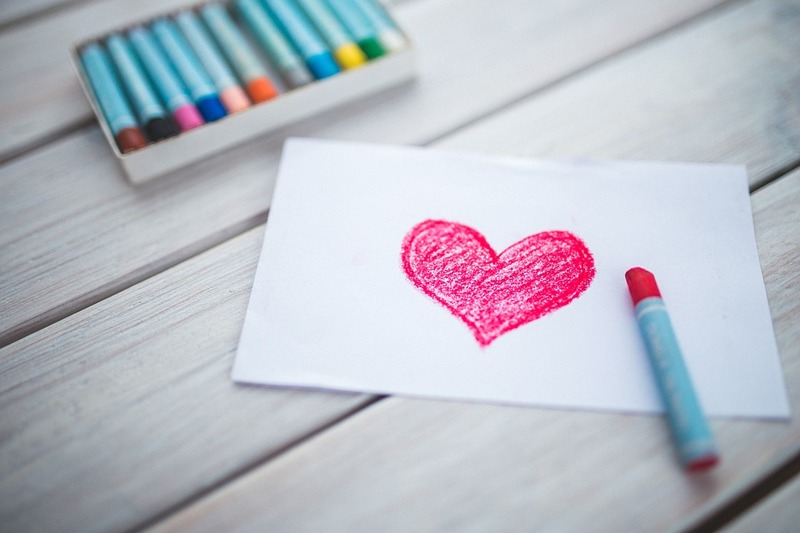 But my heart (love-based thinking) guided me to share it with the hope of helping families like yours build a deeper level of connection and trust between you and your children. My 12-year-old son lied to me. That was the first strike. But then he lied to me about the same thing again — directly to my face. The second time he lied, I already knew the truth. For his sake, I’ll keep the details out. But knowing that he looked me in the eyes and deliberately misled me truly upset me. In the past, I would’ve let my ego get the best of me. I would’ve been furious and would’ve let him know how angry I felt by the decibel of my voice. And most likely, I would’ve finished my rant by grounding him. But instead, I took a deep breath. Honestly, I was frustrated. I didn’t understand why he lied about what he did the first time, much less twice and to my face to boot. I wanted to yell. I wanted to let him know that I found him out and that I wasn’t blind or stupid. But instead, I closed my eyes. It took some work, but I moved my awareness away from the angry thoughts in my head and onto the sound of my breath. Not the staggered chest breath that I took when he lied to me, but a conscious breath. I closed my mouth, breathed into my nose and followed my breath down into my belly. Have you ever experimented with this? If you’d like, try it now. Close your eyes, breathe in through your nose deep down into your belly, allowing your belly, chest, and shoulders to rise. Exhale deeply and completely. Repeat 2 more times. How do you feel? With my heart rate lower, I considered the situation. Yes, he lied. Yes, lying is unacceptable. But, the subject of the lie was something I wanted to have a constructive discussion about in addition to the lying itself. I could see that I had not one, but two choices. A. I could let him know how angry I felt that he betrayed my trust and show him who’s boss. I knew he’d learn something by my reaction. But I considered which had more to gain: his development or my ego? B. I could use this as an opportunity to talk to him about trust. I could let him know that he’d compromised my ability to trust him and that he’d need to earn my trust back. I could remind him that he’ll be a teenager in two weeks and that if he wants me to honor and respect his need for greater freedom, he needs to honor and respect that our relationship needs to be built on honesty. I could let him know that it’s OK to make mistakes — that mistakes are opportunities for self-awareness and growth. And that admitting your mistakes takes courage and builds character. Most importantly, I could let him know that if he lies, I don’t know how I can best support him to overcome his mistake or choice that wasn’t in his best interest. And I could use it as a segue into talking about the issue he lied about. Needless to say, my emotions were not limited to just one. 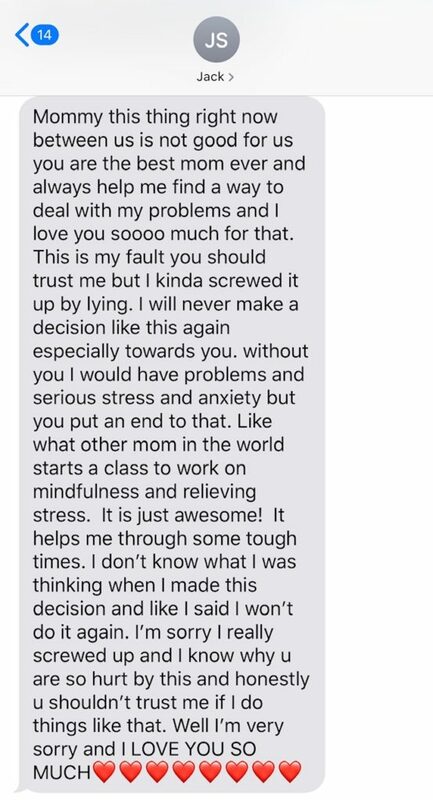 But surprise was the first emotion I felt when I received such a heartfelt text from my preteen son who often has a difficult time expressing his feelings and emotions with words. About 5 years ago, I began practicing meditation and mindfulness to better manage my own emotions. I didn’t realize at the time how the internal stress I’d been experiencing and tried to ignore had been impacting my ability to show up for my family as the best version of me. The changes I experienced were so significant and so inspiring that I started sharing some of the practices I was learning with my boys. Now, we’re practicing together. And we’re all experiencing little miracles every day — subtle, yet significant shifts that are empowering us to manage our emotions in a more grounded, intentional way. And from this more mindful perspective, we’re treating each other, and ourselves, with greater acceptance, compassion, and love. There’s an easy-to-remember, easy-to-follow 4-step process that can strengthen your ability to thoughtfully respond to your kids rather than emotionally react. Do you know what this means? Less guilt! The beauty of this practice is that it’s NOT an exercise that requires you to set aside a certain amount of dedicated time to do. Rather, it’s a practice you implement in your everyday interactions and over time, will naturally become a way of life! Even more, this powerful tool can help strengthen your kids’ ability to respond intentionally versus react impulsively! Enter Your Email to Get Your FREE Mindfulness Practice Tool !